Transcultural Buddhism: Where do pets go when they die? Grieving for dead animals and rituals to strengthen your karmic bond with your dead pets. 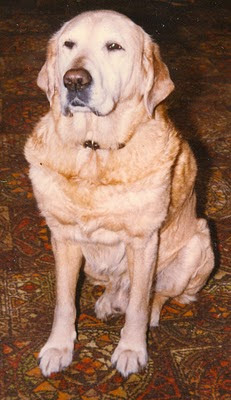 A recent article on the BBC website discussed how people grieve for the death of a pet. Many of those facing up to such sadness want spiritual reassurance. When humans die, many religious relatives have the consolation of their belief in an afterlife, however in the case of deaths of animals no such consolation is available from the Abrahamic religions, where funeral rites for animals would be considered blasphemous. There have been recent attempts to fill the gap left by the neglect of the spiritual welfare of animals in these religions, which do not normally recognise the spiritual and karmic significance of the human-animal bond. Traditionally, the Abrahamic religions state that only humans have souls, whereas animals are automata (biological machines) whose minds cease at death. Joseph Rickaby SJ, an influential Jesuit theologian, said that animals had no souls, no rights and no feelings and were no more than automata - like clocks - and if they squeaked or made noises when damaged this was equivalent to the mechanical sounds a clock would make if it fell to the floor and was similarly damaged. "We understand that throughout this world millions of humans and billions of animals die every day from so many different causes. If these living beings have the opportunity to take rebirth in a Buddha’s Pure Land they will attain permanent liberation from suffering and experience pure and everlasting happiness. Our practice of this powa offers them this precious opportunity. By engaging in this practice we ourself will create a great collection of virtue, which will also lead us into the pathway to the Pure Land of a Buddha. We perform this powa practice on behalf of those who have recently died, traditionally within forty-nine days of their death. As preparation for this ritual practice we begin by arranging beautiful offerings such as candles and flowers. On a piece of paper we write in red ink a large letter ‘R’, which symbolizes the contaminated rebirths of all the deceased. We attach the paper to a stick to resemble a flag, and place this flag in a suitable container such as a small vase. We also prepare a candle, which should be placed on a flat plate. Both the flag and candle should be arranged on a table in front of us. 1 On behalf of the deceased, we accumulate a great collection of virtue and merit. We do this by making prostrations and extensive offerings to the holy beings, so that the deceased gather the necessary conditions to take rebirth in the Pure Land of a Buddha. 2 On behalf of the deceased, by sincerely making requests to Buddha Vajrasattva with the recitation of the hundred-letter mantra, we purify the four main obstacles to their taking rebirth in the Pure Land of a Buddha. These obstacles are their non-virtues and negative actions created (1) physically, (2) verbally, (3) mentally, and (4) by their body, speech, and mind together. 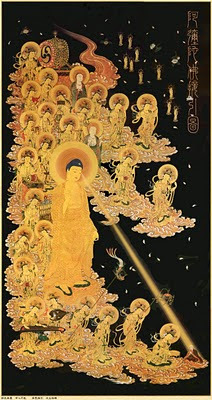 3 Through the power of our compassionate intention, strong prayer, and concentration on the practice, we transfer the consciousness of the deceased to the Pure Land of the Buddha of Compassion so that they will experience pure and everlasting happiness. 4 Through the power of our concentration on the final special ritual practice, together with the mantra recitation, we create a special auspiciousness for the deceased to attain permanent liberation from samsaric rebirth." It would be good if the followers of the Abrahamic religions could cognize that they may meet there enemies after they die. Some of them being the animals that they thought were worthless. May i know what happens when pets die , do their souls linger here on earth around their masters (pet owners) for a few days / weeks / months ?? or do they take re-birth immediately ?? I'm a Hindu and we too believe in re-incarnation and karma . When i was a child i used to attend religious lectures were i've heard that in Hinduism some believe that after a dog-birth , there comes human-birth . Do buddhists hold the same belief ? That is not what Buddhists believe. All depends on Karma. If a human or an animal die, if they have done good karma in their past lives go to a better place. But certain bad karma has more power ie killing etc. This life is a temporary stop as you will be borne numerous times in a another body depending on your past karma. This is a vast subject, not easy to explain like this. Karma is like a shadow, coming behind you. Buddha had 500 past lives. Until you attain nibbana, the sansara will not end. Sometimes you will not be borne right after the death, there will be an interim period called Gandabba. If you are interested, visit the monks at West End Buddhist Center in Mississauga and have a discussion. Thank you for your interest. Can anyone tell the Tibetan Buddhist way of mourning a loss pet, a VERY dear friend? Certain mantra's,? I don't have any idea where they will go but I wish I can go there so I can be with my beloved Tyra again. We miss her so much and we can't accept that she is no longer with us anymore. Thank you to our friends and to pet cremation hampton roads for giving our dearest Tyra a great service.